Earlier this year, Audubon announced that they had posted all of John James Audubon’s drawings on line at high resolution for free! Hmm, it’s tempting to download them all. Check out my new story at the USFWS Northeast Blog here. Interesting news about bat conservation in urban areas! Need a little moment of zen? If you don’t know about Bob Ross and his cult-classic painting show, then you are in luck. In fact, there is an episode where he introduces his audience to a live rehabbed nighthawk (at around 0:27). Cats and birds don’t mix. Listen, I love my cats. But, I know, just by looking into their blood-thirsty eyes that they would like nothing more than to get their furry little claws around the neck of every bird that visits my feeders. So, they stay inside, unless they consent to a brief foray around the yard at the end of a leash. Previously, I detailed all the ways that you can make your backyard more wildlife friendly, including curbing your cats’ roamings. In addition, Birdlife International detailed the ways to keep your cat happy and the wildlife safe. I lived in Oregon for 15 years, partly in Portland and partly in Corvallis where I went to school at Oregon State University. This place has great importance to me, but it started long before I moved there in the late-’90s. When I was 10 years old, my family visited the Oregon coast where I complained about the cold and rainy June weather. If only we had visited in July, I would have realized that the rest of Oregon summers are perfect (except perhaps for this year). In high school, I visited a friend in Bend and fell in love with the high desert. 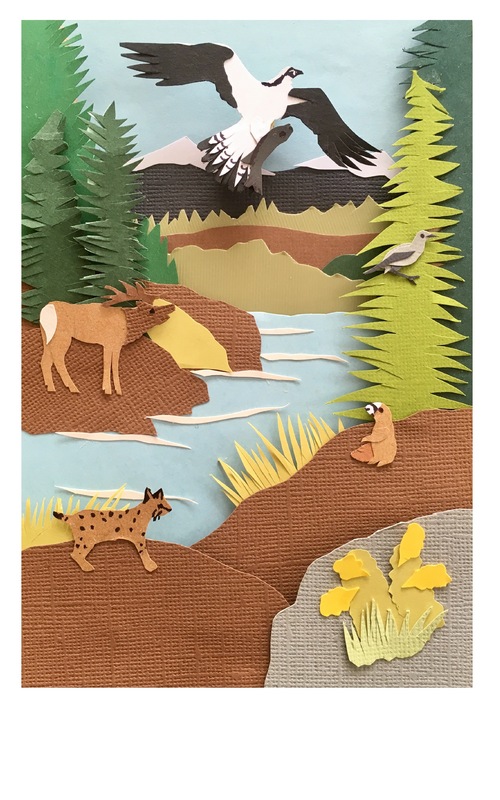 I recently made a shadowbox of the Deschutes River Valley with the Three Sisters Mountains in the distance. Sisters Wilderness OR: Osprey (with trout), Clark’s Nutcracker, Elk, Yellow-bellied Marmot, Bobcat, and Seep Monkeyflower. Portland Backyard with Coyote, Varied Thrush, Northern Flicker, Bushy-tailed Woodrat, Banana Slug, Chestnut-backed Chickadee, and Anna’s Hummingbird. Malheur National Wildlife Refuge with the Steens Mountains, American White Pelicans, Common Nighthawk, Jackrabbit (ear tips), Bobolink, Western Grebes, and Weasel.